Research showing that more than 90% of horse owners did not feel confident in spotting early signs of colic has sparked a new initiative aimed at catching the dangerous condition early. Colic is the most common emergency problem in horses and one of the main causes of death. A range of causes are known, from intestinal spasms to the gut dying due to becoming trapped, and this can make diagnosis difficult. An early and accurate diagnosis is crucial in trying to prevent cases becoming critical or fatal. The University of Nottingham research, presented today at the British Horse Society’s 2016 welfare conference, found that colic accounted for one in three emergency veterinary call-outs to horses. At least one in 10 of these cases may be critical, and up to 80% of these critical cases result in death or the horse being euthanised. 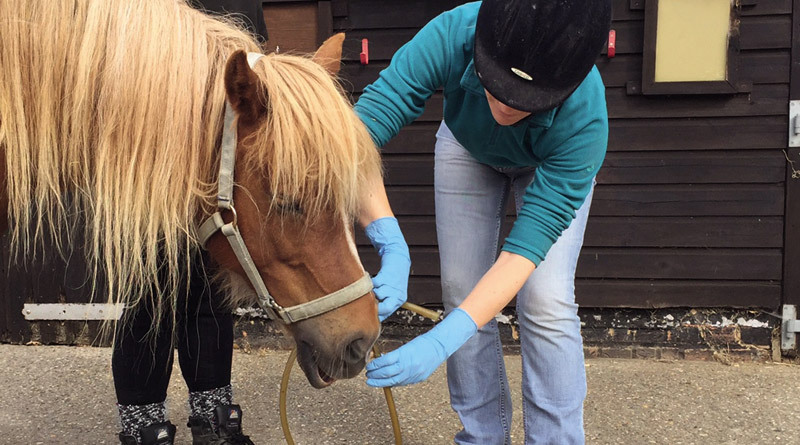 In a bid to prevent colic reaching critical stages, the university and society have set out to educate horse owners about the issues relating to colic, in particular identifying the more subtle, early signs of the condition. A library of new resources has been produced to support horse owners in being prepared should colic occur. The two institutions hopes that the REACT Now to Beat Colic campaign will get help to horses sooner, which could well prove life-saving. “We know how daunting colic can be for horse owners, and a lot of people don’t know how to spot its early signs,” horse society welfare officer Emmeline Hannelly said. She said the material was created to be helpful and clear in guiding horse owners on all aspects of colic. The guides, she said, would support horse owners in dealing with colic; from its prevention to the worst-case scenario of emergency decision-making. Professor Sarah Freeman, from the University of Nottingham’s School of Veterinary Medicine and Science, outlined the work done on colic. “For the past five years we have been conducting systematic reviews of the evidence on risk factors for colic as well as different diagnostic tests,” she said. “We have also generated new evidence on what happens when vets first see horses with colic and have run surveys, workshops and consensus voting to ask vets and horse owners about their experiences and opinions of colic. That work includes two studies in which researchers looked at the first assessment of more than 1000 horses with colic, and also asked more than 200 vets how they went about diagnosing the condition. The papers, published in the journals Veterinary Record and Acta Veterinaria Scandinavica, provide the first published analysis of the initial presentation of colic, which identified key, early differences between critical and non-critical cases, and a comparison of how first evaluations of horses were conducted by vets. The research identified marked variations in how the 228 veterinary practitioners who took part in the survey approached suspected colic. It also identified some of the main factors that affected their decisions, including safety concerns around performing some procedures in the field. The research showed that colic was the condition that horse owners considered to be the most important emergency problem, and one of the most common “out of hours” emergencies seen by vets, Freeman said when the research was published last year. The researchers, writing in the Veterinary Record, said the marked variation in practitioners’ approaches found in the research highlighted the need for further evidence to support decision-making. In the study, they distributed a questionnaire to veterinarians involved in the primary evaluation of horses with abdominal pain, asking, among other things, about their selection of diagnostic tests and factors that affected their decision-making. A total of 228 responses were analysed. The majority – 48.2 percent – said they were very confident in managing a colic case. The most frequently used diagnostic tests were the horse’s response to painkilling medication, rectal examination and nasogastric intubation. “The financial situation of the owner was considered an important factor when deciding whether to use haematology and biochemistry, ultrasound examination and response to analgesia/treatment,” the researchers reported. “Approach varied between practitioners and for all diagnostic tests, with frequency of use ranging from 0 to 100 per cent of cases. “There are concerns within the equine veterinary profession about the impact of the current financial climate on owner decision-making and treatment options for equine colic,” they continued. The risk to personal safety was the most common reason cited for not conducting a rectal examination. Further research published in Acta Veterinaria Scandinavica evaluated data from 1016 primary evaluations of horses presenting with clinical signs of colic. Case details were submitted by 167 veterinary practitioners across Britain over a 13-month period. The average age of the horses was 13.5 years. The average heart rate on primary presentation was 47 beats a minute, with a range from 18 to 125. The average respiratory rate was 20 breaths a minute, ranging from 6 to 100. A rectal examination was performed in 73.8 percent of cases. Cases that responded positively to simple medical treatment were ultimately categorised as non-critical. Cases that required intensive medical treatment, surgical intervention, or resulted in the death of the horse, were categorised as critical. The researchers found that 822 cases met either of these criteria – 76.4 percent were non-critical and 23.6 percent were critical. The study team reported that pain, heart rate, the nature of gastrointestinal noise and simple indicators of hypovolaemia – a decreased volume of circulating blood in the body – were significant indicators of critical cases, even at the initial veterinary examination. These should be considered essential components of the initial assessment and triage of horses presenting with colic, they said. Discussing their findings, the researchers said more evidence was required on how different tests contributed to decision-making, why veterinarians preferred some tests over others, and the influence of factors such as cost, the condition of the horse, available facilities, and the wishes of owners. Colic resources can be found online here. The full study can read here. Both studies are published under a Creative Commons License. Hi,I’m from NZ,when our horses first show any signs of colic,ie restless. Wanting to lye down,we give them one to two bottles of beer,or can use ginger beer,I always carry it in my truck.We then keep them walking and try to calm them down. Have been lucky so far that this has worked for mine. We had one horse that acted like it was coming down with colic and I had the vet tube her and give her a gal of mineral oil that the vet carries in his truck. It seems to work fine this is one way to clear out a blockage in the intestines. It works like a human taking a extra large dose of mineral oil. The next morning after watching her all night she was fine.